Doctor in Chemistry and Professor of Biochemistry and Molecular Biology at the University of La Laguna and member of the Institute of Biomedical Technology of the University of La Laguna. I have developed teaching and research activities in other universities either in Spain (Complutense of Madrid, Murcia and Granada) and foreign (Edinburgh, Technique of Vienna, Michigan and National Quilmes, Argentina, Technical University of Lotz, Poland, National Institute of Chemistry, Slovenia and Central University of Venezuela, Venezuela). I am a specialist in Systems Biology and Metabolic Engineering, with contributions in the field of Computational Biology and its applications in the fields of Biotechnology and Biomedicine. As director of the research groups of Mathematical Modeling and Systems Biology since 1995 and more recently as founder and director of the NEUROSYS group, both registered at the University of La Laguna. I have been steadily directing up to 30 years many research projects of national regional scope in biotechnological and biomedical or evolutionary subjects. As a result of this activity, I have published more than 100 international scientific articles, book chapters and a specialized monograph on biosystems modeling and optimization. I have been an evaluator of projects and scientific articles for numerous national and international journals and research agencies (ANEP, FFWF in Austria, NSF in the USA, Welcome Trust in the United Kingdom, FONCyT and ANPCyT in Argentina, NEST Pathfinder NEST- PATHFINDER, etc.) as well as evaluator of university quality agencies. I have held several positions of responsibility in the field of institutional assessment and promotion of the quality of the university system: Director of the Canarian Agency for Quality Assessment and University Accreditation (2004-2007), Secretary of the Spanish Network of University Quality Agencies (2006). During this stage I directed several programs of institutional evaluation of Scientific Research Centers of the Canary Islands and University Departments of the Canarian universities. I’m evaluator of different programs with the several national agencies of university evaluation such as ANECA (I was member of the National Commission of Professors Accreditation, Sciences area), AQU Catalunya (evaluator of bachelor and postgraduate programs), UNIBASQ (Vasque Country) and UCUA. I was a member of the Council of Experts for the External Evaluation of the Agency for Quality University of Castilla-La Mancha and UNIBASQ, member of the Technical Unit of the Thematic Project of Institutional Evaluation of the University of La Laguna; coordinator of the Division for the elaboration of Mathematics, Experimental and Technical Study Plans of the University of La Laguna; coordinator of the Commission for the Development of the Science and Food Technology Studies Plan of the University of La Laguna; coordinator of Quality and Teaching Innovation for the Faculty of Biology of the University of La Laguna, responsible for the design and implementation of the Quality Assurance System for the Degree in Biology, the promotion of virtual teaching in the Faculty and the elaboration of the Degree in Biology. I have been Director of the Secretariat of Academic Organization; Secretary of the Doctoral Commission at the University of La Laguna and Coordinator of the Study Plans Commission of the Mathematics, Technical and Experimental Division. Since 2012 I am the dean of the Faculty of Sciences of the University of La Laguna. Néstor Torres; Guido Santos. A simple simulator to teach enzyme kinetics dynamics. Application in a problem-solving exercise. Higher Education Pedagogies. 2 - 1, pp. 14 - 14. Routledge. Taylor and Francis. Nestor Torres. Introducing Systems Biology to Bioscience students through Mathematical Modelling. A Practical Module. Bioscience Education. 21 - doi:10.11120/beej.20, pp. 1 - 10. The Higher Education Academy. Isabel Belmonte; Nestor Torres. 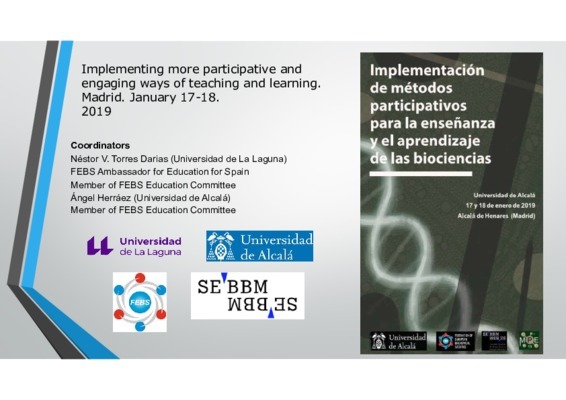 DOCENTIA-ULL: A programme for Evaluating, Promoting and Development of Teaching Performance at the University of La Laguna. ANECA. Study of control coefficient profiles in metabolic systems by computer simulations: influence of the pathway substrate and negative feedback on the control of the systems. Biochem. Educ. 20-1, pp. 48-50. Elsevier. Nestor Torres Darias; Enrique Meléndez hevia; Jose M Riol Cimas. A Study of the Distribution of Flux Control Coefficients in an in vitro Metabolic System: A Practical Exercise. Practical Biochemistry for Colleges. pp. 107-109. Pergamon. Guido Santos Rosales; Nestor Torres Darias. A simple simulator to teach enzyme kinetics dynamics. Application in a problem-solving exercise. DOI: 10.1080/23752696.2017.1307693. Higher Education Pedagogies. 2-1, Routlege. Taylor and Francis. 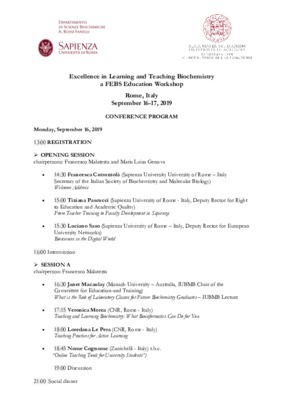 Thus can contribute as trainer in future education workshops in subjects such as of university quality assessment system and titles accreditation and in topics such as mathematical modeling of biosystems, the introduction to the System Biology, the enzyme kinetics and the use of active, participative teaching approaches as blended learning, peer learning, peer evaluation and peer teaching.